Over the years I’ve reviewed most of Warm Audio’s excellent reworkings of vintage kit. Its preamps include models emulating the legendary Neve 1073 (the WA273-EQ) and a new look at the API sound with the WA-412 on test here. 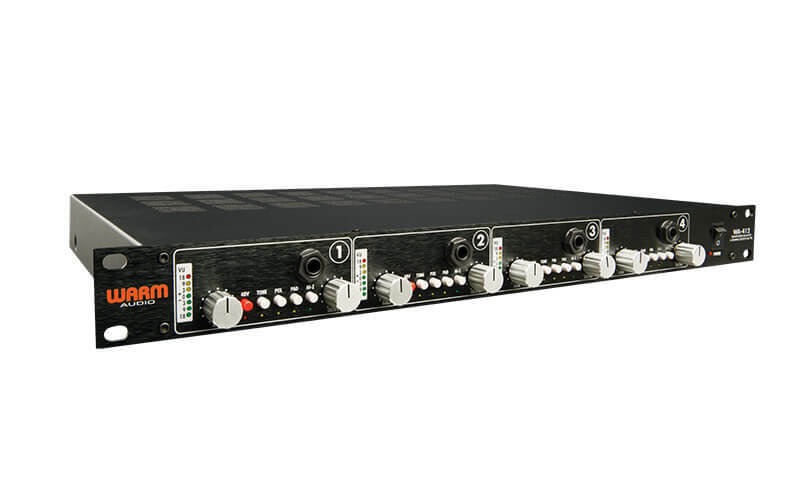 It has four mic/instrument preamps in a sleek 1U 19″ rackmount case. It’s a fully discrete, high voltage, dual-transformer design with a maximum +65dB of gain. Whereas the earlier WA12 preamp uses CineMag transformers, this uses large, custom-wound transformers from US-based Altran. Warm Audio worked closely with Altran to create these, using a vintage winding technique to get the larger-than-life API sound. The discrete X520 op-amp is a reproduction of the classic 2520, designed to produce clean, open tones at moderate gain settings, yet able to be driven into mild saturation at higher levels. While the six-pin X520s contribute significantly to the sound of the WA-412, they can be swapped for similar op-amps from other manufacturers to customise the sound of the unit. Each channel has pots for both input gain and output; think of the output knob as a console fader. These pots are stepped, making precise gain matching of two or more channels easy. Hi-Z DI inputs on the front panel send the instruments’ signal through all stages of the preamp circuit, allowing the tone to be shaped in the same way as mics connected to the rear panel XLR inputs. The back panel features XLR balanced inputs and XLR/TRS balanced outputs for each channel as well as an earth grounding lug, 115v/230v selector and a socket for the IEC power lead. A key feature is the Tone control. When engaged, the step-up ratio of the input transformer is increased to bring out more colouration from the transformer and op-amp. This drops the impedance from 600 to 150 ohms and increases gain by 6dB, Warm recommends 600ohms for condenser and dynamic mics and the 150ohms setting for ribbons and lower output dynamics, but there are no hard and fast rules. In fact it’s the tone engaged (150ohm) setting that more accurately mimics the full-bodied nature of vintage API consoles, while the 600ohms setting is cleaner and more modern. 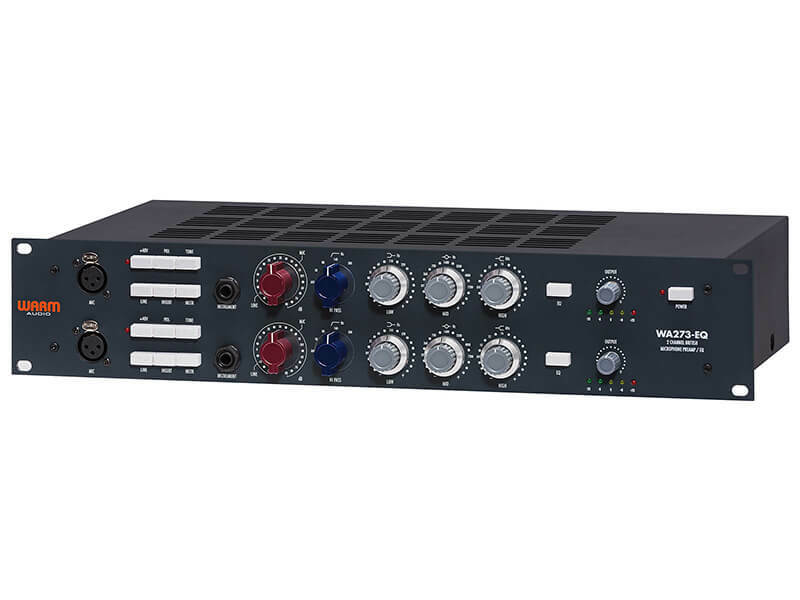 Visually, the WA-412 has a similar layout to API’s current 3124V 4-channel mic pre without being an exact copy. The recognisable API pots have been replaced with a more generic design and, while they don’t really look the part, they are lovely to use, their stepped response inspiring confidence. All other switchgear feels solid enough and, like all Warm Audio products, the build quality is excellent for the price. Before using the preamp on a session, I plugged in an AKG C414 and recorded some speech, followed by acoustic guitar, to assess the amp’s basic character. Starting with the tone control disengaged (600ohms), the big, solid sound of the vintage consoles was immediately apparent. Repeating the process with the tone control switched on (150ohms) the WA-412 gained an extra degree of presence, though it wasn’t a night and day experience. Having a high-quality analogue front end for your mics and instruments is key to warming up sterile digital sound. Four channels offer greater flexibility when tracking more than one source simultaneously. API, though not as well known as Neve on this side of the pond, produced some of the greatest consoles in the 1970s. The punchy, solid sound of those consoles can be heard on many classic American rock albums from the 70s and beyond. The WA-412 is a convincing take on that sound. Probably not the first choice for natural acoustic music (jazz and classical for instance) where a more transparent sound is favoured, the WA-412’s colourful character is well-suited to all forms of modern production, whether it’s classic guitar rock, modern pop or dance. During a tracking session, I used all four channels to track a drum-kit using a variation of the Glyn Johns technique. For the main stereo pair I used Coles 4038 ribbon mics, known not only for their deliciously phat mid range, but also their insensitivity; they require plenty of gain. I briefly listened at the 600ohm setting; however upon engaging the tone control, the sound became meatier, with an obvious increase in punch and slam. Winding up the gain added colour and some crunch, accentuating the crack of the snare drum. Interestingly, for the kick drum (mic’d with a vintage AKG D12), I opted for the standard setting, sending the signal to a Tube-Tech EQP-1A copy for some tone shaping. I often augment the classic three-mic Glyn John’s method with an under snare mic and our Neumann KM84i sounded great through the WA-412, even though it lacks a high-pass-filter I’d normally use for this. I then hooked up a Beyer M201 to the preamp for some electric guitar overdubs, again engaging the tone and cranking up the gain for added saturation. I’ve always liked API style preamps to record electrics, often preferring them to Neve style amps, which generally sound smoother without the forceful API midrange. The WA-412 didn’t disappoint, sounding gutsy with just the right amount of bite. Although I would happily use the WA-412 for all my lead vocals, if it was my main preamp, it couldn’t compete on this session with my Thermionic Culture valve amp, which is more open with a silky top end; the WA-412 has more of a rock ‘n’ roll heart. I can imagine however, the WA-412 being perfect for vocals requiring a more forceful presentation. I was able to compare the WA-412 with some of our other mic pres, including the CAPI VP26, another API clone. The VP26 is based upon an early vintage API console rather than the later 312 schematic the Warm unit copies, yet the two preamps sound remarkably similar, both amps sharing the unmistakable robust API sonic signature. The VP26 is perhaps a smidgen brighter but there’s really very little in it. By way of contrast, our Thermionic Culture Early Bird valve preamp couldn’t sound more different from the WA-412, lacking the thick lower mids and hefty low-end of the Warm op-amp unit, instead offering a more even midrange with no aggressive characteristics, along with greatly extended frequency extremes. A comparison with a channel on our late 1980s DDA console reaffirmed the WA-412’s take on the API sound to be very much at the punchier end of the spectrum. With its latest vintage American style preamp, Warm Audio has taken the API sound to a new level. Delivering a punchy performance with a vivid, forward midrange, the WA-412 excels in bringing out the energy in all types of modern pop recordings, from rock to hip hop and electronica; a new, retro-modern classic. You could push the boat out and go for an API 3124V, a 4-channel mic pre with 2520 op-amps and a 3:1 output transformer selection. Based on the legendary 3124+, it has the same mic input transformer as well as API’s proprietary output transformer.